Shopping around for great rates on auto & home insurance can be time consuming, which is why so many people feel stuck overpaying for their coverage, year after year. That’s why OpenRoad has partnered with Answer Financial, one of the largest auto and home insurance agencies in the U.S., to make shopping for a better deal easy. 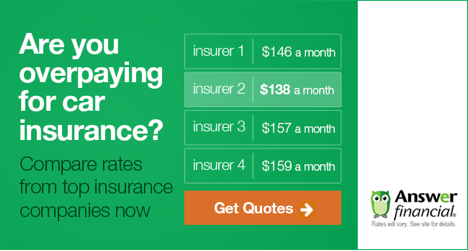 The free service that monitors auto insurance rates and notifies you when you may be able to save on your policy. Click here or on the banner Above to get started or call (800) 931-5161 today to speak to knowledgeable agent. *National average auto insurance savings per year reported by new customers surveyed by Answer Financial from January – June, 2016. Answer Financial(R) Inc. offers insurance products and services through its insurance agency licensed affiliate Insurance Answer Center, LLC (California License # 0B99714); in New York as Insurance Answer Center, LLC, an Insurance Agency; in Michigan as Insurance Answer Center, LLC, an Insurance Agency; and in Missouri as Answer Financial. Answer Financial affiliated agencies are not insurance companies, but act as agents for certain insurance companies. Answer Financial’s affiliate Right Answer Insurance Agency, LLC (CA License #0H52358) operates as an insurance broker in California and an agent in all other states. Answer Financial is paid commissions and may receive other performance-based compensation for its services. The compensation received by Answer Financial and its employees may vary by insurance company. Not all insurance products and services are available in all states. Rates are subject to change.